Pielstick PC 2v cylinder head for marine engine and diesel generator spare parts. 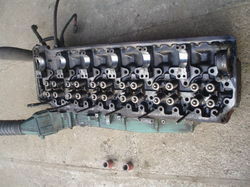 Remanufactured cylinder heads are supplied after thorough repairs, inspection and hydraulic test. Old valve seat, valve guide and valves are replaced by new one. 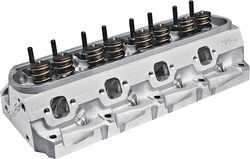 Remanufactured cylinder heads are cost low and are available in stock. Being an industry leader, we offer wide variety of Cylinder Head to our clients. Sourced from trusted vendors, these Heads are made using high quality raw material. These have major role in any modern diesel or gasoline engine for reducing exhaust emissions, improving power output and fuel efficiency. We also offer customization services to our clients at reasonable prices. Cylinder options offered can be made available by us in different base metal construction options like boron-copper chrome cast iron alloy, boron alloy, steel and others. Further, for lasting performance, these can also be provided with different surface treatment options like phosphated, quenching, chrome plated and others. With vast experience and knowledge we are involved in offering a premium quality range of Cylinder Screw Head. The cylinder screw head are engineered to perfection and are known for their finish and coating. We are offering Mild Steel Cylinder Head to our clients. Cap (cylinder head cover) with rubber seal. We undertake development or new components by reverse engineering with latest techniques. Dimensional data in the form of point clouds and co-ordinates is subject to advanced high end three-dimensional surfacing and solid modeling software. We are a reputed firm engaged in offering the best quality Tata Ace Cylinder Kit. These cylinder kits are available to clients at budget-friendly market prices in multiple specifications. These cylinder kits are used in various vehicles for the purpose of fuelling them. These are easy to install, robust and damage-resistant. - Used in most piston engines to open and close the intake and exhaust ports in the cylinder head.